Book Review: Hunter Shea – I Kill In Peace. After the disappointment of my last read I was looking to get back on track and Hunter Shea’s ‘I Kill In Peace’ was just the sort of quick fire book I was looking for. I have enjoyed a number of Shea’s other works such as ‘They Rise’, ‘The Dover Demon’ and ‘Island of the Forbidden’. He has that classic American horror voice that provides good scares, solid characterisation and great storytelling. I had heard a few things about this novella, mostly about how it was very different to the sort of horror usually associated with the author and it turned out to be right. What I did discover was a thoroughly entertaining read. We follow the journey of Peter Blades (appropriate name given the circumstances of the book) and what happens after he is made redundant from his job. Peter begins receiving strange text messages from an unknown source telling him to commit brutal murders with an ancient blade that mysteriously appears. Peter travels around in an even more mysterious red mustang carrying out these unspeakable acts of violence. Most of the perpetrators deserve all they get and you will begin routing for Peter as his journey unfolds. There are enough clues scattered throughout the story for you to piece together what is happening. Readers familiar with the bible will pick up on what is happening pretty quickly I would imagine, but for myself it was left until the end of the book before I was able to come to terms with what had preceded. This will be Hunter’s final release for Samhain publishing and what a great way to go out. 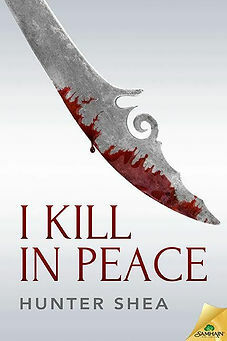 ‘I Kill In Peace’ is a very original story. It is different from Shea’s usual work, but a great and gruesome tale. Thoroughly engaging, the pacing was perfect, Peter was a great character and it was highly original. I had a huge amount of fun with this novella and I bet Hunter did too. Great stuff. You can pick up a copy of ‘I Kill In Peace’ from here.